stunning jukebox in space saving slim cabinet! 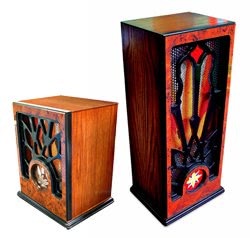 An irresistible jukebox with a slim, space-saving cabinet! 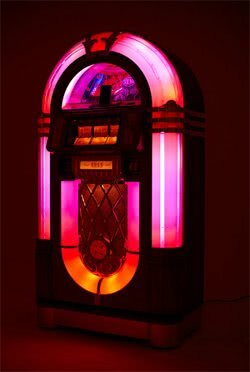 The Sound Leisure Melody is designed to offer the same features and build quality you'd expect with any full size jukebox, however its cabinet has had a whopping 235mm taken from it's depth, providing it with a slim build. A shuffle play facility and a 80 disc rotating title rack is included, giving you a huge amount of music options. It also includes a remote control for home use. The Sound Leisure Melody is also available with the option of a Bluetooth Wireless Kit, an LED lighting system and a selection of speakers. 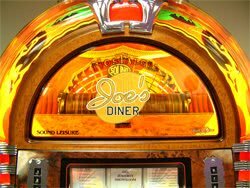 This fantastic jukebox has been designed to become the perfect centre piece of any environment. Diamond Pack Lighting System - Make your classic jukebox shine even more brightly with this LED lighting system that allows you to use the latest programmable LED technology to create a custom light show to suit any mood - including custom colours and preset patterns such as "antique", "Xi" and "Disco"
This product is delivered by Sound Leisure who will contact you by telephone to confirm the delivery day and a time. Delivery is around 10 weeks depending on your location.